Most people don’t realize it, but your gums are just as important to your smile as your teeth. That’s because healthy gums are what keep your teeth stable and solid in their sockets. In fact, since your gums are the foundation of your oral health, gum problems can actually put you at risk for tooth loss. Even teeth with no cavities can fall out if they don’t have healthy gums to support them! But are you at risk for tooth loss if you have gingivitis – or is gum disease a bigger concern? In this blog, you’ll find out how those two conditions are different and also how they’re treated. Learn more today! What’s the Difference Between Gingivitis and Gum Disease? This is actually a trick question because gingivitis is the first stage of gum disease. Although it’s a mild form of the condition, it can lead to more advanced stages if it isn’t treated. Gum disease refers to more serious gum problems that cannot be reversed or cured. Fortunately, it can be well-managed and controlled to prevent tooth loss. 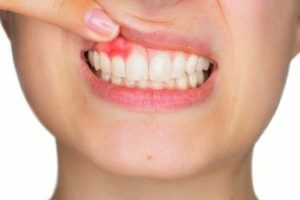 If you’ve noticed any of these symptoms, it’s a good idea to schedule an appointment with a dentist who can evaluate your gums to determine if you have gum disease. They’ll be able to recommend the appropriate treatment based on their findings. How Can You Prevent and Treat Gum Disease? The good news is that gingivitis is completely reversible with regular dental care and good hygiene habits! Establish good hygiene – Daily brushing and flossing is the foundation of gum health. Quit smoking – Smokers have a higher risk of gum disease, so talk with your doctor or dentist about the many available aids to help you quit. Manage your diabetes – Researchers have found a link between gum health and overall health, and have found that patients with diabetes are more likely to have gum disease. Gum disease is very common among adults, but with regular dental care and these tips, you can prevent tooth loss and enjoy great oral health for many years! Dr. Charles Beliveau is a general, restorative and cosmetic dentist who knows how crucial gum health is to oral health. His goal is to help everyone have a healthy smile for as long as possible, so he always keeps a close eye on his patient’s gum health so he can recommend the best treatment when necessary. If you have any questions he can be reached via his website or at (978) 465-5358. Comments Off on What Is the Difference Between Gingivitis and Gum Disease?